Leira's family flee to the island of Crete just before a huge volcanic eruption destroys their island and sends a tsunami to where they thought they had found safety. Another thrilling adventure by acclaimed author Wendy Orr. I wonder if the first day of Learning is always like this, do the girls on the hill always feel the ground tremble under their feet? Leira is about to start her initiation as a priestess when her world is turned upside down. A violent earthquake leaves her home and her family in pieces. And the goddess hasn't finished with the island yet. With her family, Leira flees across the sea to Crete, expecting sanctuary. But a volcanic eruption throws the entire world into darkness. After the resulting tsunami, society descends into chaos, the status and privilege of being noble born reduced to nothing. With her injured mother and elderly nurse, Leira has only the strength and resourcefulness within herself to find safety. Each morning as the sun rises, the small island nation of the Swallow Clan sings the praises of their creator, The Goddess. Leira is preparing for her Learning ceremony, her transformation into womanhood after her first bleed where she will serve The Goddess guided by Our Lady, a woman and spiritual leader among the Swallow Clan community. As the chosen young women begin the pilgrimage upon Crocus Mountain to collect saffron for their ceremonial offering, the mountain begins to tremble. The Goddess has awoken. The small, spiritual island is experiencing earth tremors as the volcanic activity increases. Residents return to their homes, their offerings and song to The Goddess remain unanswered as the sky clouds with ash, decimating the pastoral landscape. Awoken by the sound, the Swallow Clan community is in ruins. Homes have collapsed including Leira and her mother, her father and brother upon the waves as the island fractures, cursed. As Leira, her mother and elderly servant Nunu are rescued, the neighbouring families find solace within the vast landscape of farmland within the island nation, before sickness infects the community. The island is no longer a haven and reluctantly, families board vessels for the mainland. Leira is a beautiful young woman, spiritual, whimsical with a quiet determination and wisdom. When her journey to become a woman is overshadowed by the trembling island, Leira believes The Goddess is awakening, the scent of sulphur from the active volcano lingers as a reminder of the sacrifices the community has blessed upon The Goddess. The island women are empowered as their daughters receive their first bleeding, signalling their journey to becoming women and serving The Goddess, a hereditary honour. The tremors become frequent, the crater sending ash across the landscape, smouldering until the island is suddenly decimated. As her family finds refuge, it soon becomes apparent that her island is contending with starvation, illness and as her father departs for assistance abroad, Leira will be responsible for her mother and Nunu. Since Leira, Nunu and her mother escaped the devastation, her mother has recovered from her physical injuries but has regressed under the emotional anguish of seeking asylum. The narrative also centres upon Nunu and her capacity as a caregiver. Nunu is a servant and although now an elderly woman, was purchased as a child for the purpose of nursing children from the esteemed, privileged family. The displacement of families, vagrancy and slavery from the narrative of a young, privileged girl. The island mythology is breathtaking and whimsical. Girls are considered women after their first bleeding and chosen for the Learning, serving the Goddess and creator as the community sings the sunrise, throughout ceremonies, illness and for the deceased. The narration cascades between prose and verse, reiterating the significance of Leira's internal monologue and how the young lady matures throughout her journey. It was magnificent. I was so enamoured by Leira and her island community, the beautiful seaside landscape, the small and colourful dwellings and a community brimming with life and spirit. The research of the island civilisation is superb, recreating the stunning and atmospheric Mediterranean so wonderfully. A true storyteller. Swallow's Dance will be enjoyed for generations to come. Simply brilliant. This sounds like an empowering novel for the young uns. Great review, Kelly! It's such a lovely read Joy and based on the mythology of Santorini, or the former island of Thera that was all but destroyed by an active volcano. It's incredibly atmospheric, I can't wait to read some of the authors previous titles. It's absolutely captivating, I couldn't put it down Aimee. I'd love to see what you think of it! Well now, this sounds *so* impressive. You have me wanting to know more about Leira so much rigth now! You'll love this one Verushka, rich mythology, beautifully atmospheric. MG isn't usually my thing but this does sound like an interesting story. 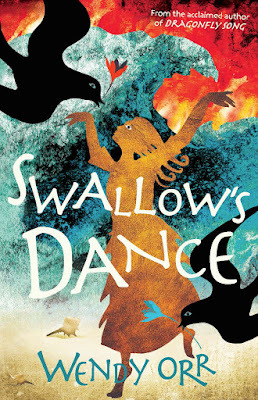 I mean, I know it can be easy to dismiss MG as immature but it sounds like Swallow Dance packs a lot into it's book and it sounds fascinating. I really want to read now. It's a wonderful read and will appeal to both middle grade and young adult readers. The prose is absolutely beautiful, I think you'll really enjoy this one. Oh wow, this sounds wonderful. What a great read for kids! It's beautiful Suzanne, one of the loveliest middle grade reads I've read this far. Looking forward to reading the authors previous titles. So glad you liked it! thanks for sharing it. You're most welcome Wendy, it was an absolute delight!